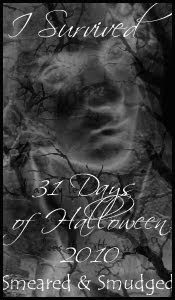 Welcome to day 29 and the new challenge at TELLENS PLACE which is DARK and CREEPY/HALLOWEEN. I have used a new image from TELLENS PLACE....it'll be in the store now or very soon.... coloured with promarkers and cut out.... .... i used a frame that i inked and distressed.... and added grungy/webby material as a background... i put my cut out image on using silicon so its quite dimentional. Heres a close-up..... boy is that winged-thing creepy...love him!!!!! 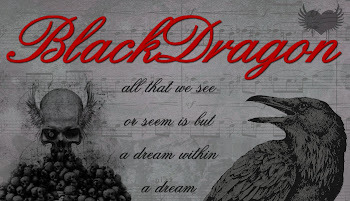 Please come and play along with us.... HALLOWEEN is nearly here..... and you really need to check out what the other TP divas have done.... all of them this time have done creepy.... even Joyce and Sandra who are the girly-girls. and mounted on black card. Hiya Lyn. I am in awe of your amazing and very creative talent. Everything seems to come so easy and effortless to you and this is yet another fine example of your wonderful creations. 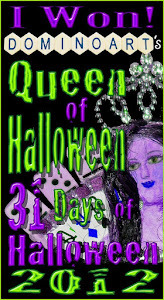 A real "QUEEN OF THE DARK"
Love the ATCs too, you are fabulous Diva. Happy crafting. WOW_ great job on all of it. I really love the first ATC. Thank you so much for sharing all the extra things with us! Oh My Goodness! All of these are spectacular!! WOW! Wow Wow Wow! Love that image from Tellens Place, it's super creepy and even more so that you have it coming out of that frame. Your ATC's are totally amazing too! What a wicked beastie you have in that frame! It looks fantastic! ANd your ATc's are of course spooktacular! the frame is fantasticly awesome! amazing, love all the colors! the atc's are great! great ATCs and the picture is creepy! I love it!! !